On the course of the ORRC Vernonia Marathon, April 2017. This picture was taken early in the race, so I still look optimistic. During the course of marathon prep, I signed up for 7 half-marathons and a 30k race, each one taking the place of the long run for the week. Three of the half-marathons resulted in personal records, which greatly boosted my confidence in my training. The last of these was the Hop Hop Half Marathon, which I finished in 1:36:22, for my first finish under 7:30 min/mi (4:35 min/km). At the beginning of 2016, I also joined a running club, Team Red Lizard (TRL), and started attending a weekly group run after the Vernonia-Banks Marathon. TRL is full of extremely talented and dedicated runners, very keen on running and having fun, some of which involves food and beer. They have been an excellent group to make new friends and get inspiration and training tips. TRL also provides pacers for the Portland Marathon, and I was part of the team of pacers for the 2016 Portland Marathon, where I ran the first half at an 8:00 min/mile pace to help other runners stay on pace target. What was also gratifying was that the fitness gained from a consistent training plan and regular training inputs from the Lizards allowed me to improve my half-marathon time to 1:31:37 at the 2016 Oregon Summer Half. Being passed by a much-faster Tim Murphy, at the appropriately named BATH TIME 2017. I tried to indicate my displeasure at his being faster than me non-verbally, but he didn’t get it. Prepping for an even better marathon. With the help of friends in TRL, including the club’s running coach (Rick Lovett), and a book on marathon training (Pfitzinger), I prepared for the 2017 Vernonia-Banks Marathon with a goal time of 3:12, 3 minutes under the qualification threshold for Boston 2018. For 12 weeks starting in early January, I would wake typically between 4:30 and 5am and run between 5 and 20 miles, 5 days a week, sometimes by myself, and sometimes with friends — snow, rain, or shine, though I should note there is very little shine in Portland during winter. Although I couldn’t attend TRL’s Tuesday track workouts, I was able to use Rick’s workout archive on the TRL website to pick from a large variety of weekly interval workouts, many of which Conor gamely joined in. On long runs, friends would join me halfway through the run to keep me going as I completed 16-22 miles along Portland’s waterfront. On some days I ran twice to meet my weekly mileage goal of 50-60 miles. As in 2016, I picked half marathon and 30k races to run as some of my long runs, and ran an extra 3-6 miles after the race to reach the mileage goal for the day. This made the long runs a lot more fun. One of the most insane races I ran during this time was Bill Aronson’s Track Half To Insure Mileage Exactness (BATH TIME), which is a half-marathon on a track, in February. 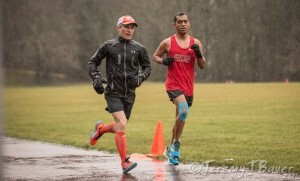 Bill has a talent for arranging for terrible weather at this event, and as usual, it featured a heavy February downpour, and a very competitive field (Peter Bromka won in 1:11:58). Bill noted later with a twinge of disappointment that it wasn’t as bad as previous years since there were no gale-force winds. It is as nutty as it sounds, so if I’m invited back, I’ll probably run this again. The most difficult part of training was giving up caffeine! A caffeine-fast is a way to make the race-morning coffee extra-effective, but it is not for the faint of heart. I started my caffeine-fast about two weeks prior to the marathon, and for 4 or 5 days I was an irritable mess. By day 3, if it weren’t for the thought of the race-day caffeine jolt, I would’ve snorted instant coffee. And do not be fooled. Mint tea is not a substitute. You might as well eat toothpaste-soup and hope to get a caffeine fix. Beet juice and Thai green chilis? On April 9, I lined up at the Vernonia-Banks Marathon start line for the second time. I knew that my training had been a lot more thorough than the previous year. I had a caffeine pill an hour prior to the race, and downed beet juice concentrate, the latter due to a research paper extolling the effects of dietary nitrates on race performance. I had told myself Vernonia-Banks would be a fun, easy course because it would have a downhill section in the third quarter of the race. At the last minute, I revised my goal downward to 3:07 (3 hours and 7 minutes), feeling overconfident in my training, and took off ready for the BQ. 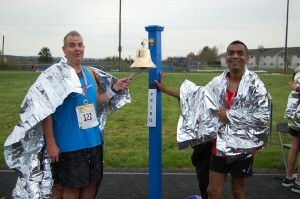 Ringing the BQ bell with my friend Paul Braghero. I’m pretty sure Paul’s hair is not naturally blue. The silver foils are mylar blankets. At mile 18, the first cramps hit. I bit down on a Thai green chili, hoping an article I’d read on hot peppers alleviating cramps would prove to be true. It did, but some of the chili fumes went into my eyes and nose. After blinking away tears, I was able to push through to mile 23 … a little over 3 miles to go. I’ve run this distance countless times, but those were the toughest 5 km I ever ran. Head tilted back to get as much air in me as possible, but feeling light-headed and knowing that if I paused for even a little bit, I would faint and/or cramp and wouldn’t be able to restart, I kept telling myself to push through the last few miles. I started slowing down as I was running on fumes (chili fumes! ), and adjusted goals from 3:07 to 3:08 to 3:09 and told myself to just meet the BQ target. Finally, I saw the finish line but I had to complete a 400 meter loop around the Banks High School track to cross it. I crossed the finish line at 3:11:43, and rang the bell meant for Boston Qualifiers. Teammates from my Hood-to-Coast team, who’d run the half-marathon, were waiting at the finish, cheering, and taking pictures. One of them texted my wife with the news, and she and other friends who were following the results online posted them on Facebook — first place masters, fifth overall, and — most importantly — BQ! I later heard someone say that the first half of a marathon is 20 miles. The 2018 Boston Marathon cutoff was 3:23 min below the qualification mark of 3 hours and 15 min. At 3 min 17 seconds below the qualification time, my entry to the 2018 Boston Marathon was not accepted. Thank you for sharing your Journey Rohit, its an amazing read!… must have been heart breaking to miss out on Boston in 2018, but you more than made up for it in the Tunnel! waiting to read Part 4 and how you had this amazing improvement over the past one year. Thanks Amit! It was good to meet you at LETM — part 6 is now online.